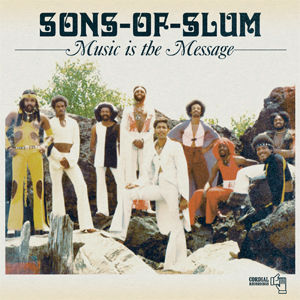 Sons Of Slum were formed in Chicago during 1964 between college friends and went on to back some of the cities finest such as The Emotions, Otis Clay, Garland Green and Syl Johnson. They were picked up for management by Mel Collins, who at the time was riding high with his wife of the time Jo Armstead and Giant Records. When the group weren’t touring extensively with some of Mel’s acts they found time to release a couple of singles on his Gamma label, both are highly respected among funk lovers across the globe. There was a break up with Ken before the group decided to record in 1977 their third album independently. This album was entitled ‘Music is the Message’ and is the set of recordings that Cordial are releasing on vinyl/CD for the first time 32 years later. At the time the group approached a number of labels and there was interest, but unfortunately for them at the time no label took up the option to release the album. The band folded in 1978 and the members moved on to other projects. Cordial Recordings are proud to release in partnership with the original band members the full set of recordings from the third album because the songs are a collection of the finest funk mixed with soul and a touch of jazz. The vinyl release comes on 350gsm white/white board outer sleeve and comes with a printed inner sleeve with extensive sleeve notes & photos that chart the history of the group. The CD release comes in a 4pp Digipack with booklet. IN STOCK – w/e 19/4/19 – Pre-Order your copy now for delivery as soon as they arrive.